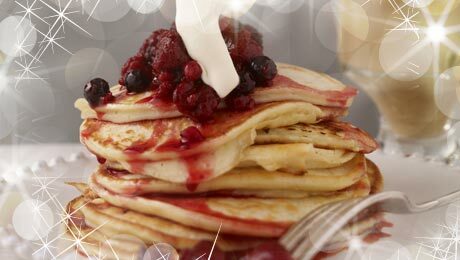 These pancakes are boozy and indulgent. For a family-friendly version just take out the rum. Sift the flour, nutmeg and baking powder into a large mixing bowl. Crack the eggs into the flour mixture and, with a large whisk, incorporate the egg and the buttermilk to the flour. Pour in the dark rum and vanilla extract. Mix well and cover the batter with clingfilm or a dry cloth and transfer to the fridge and allow it to rest for at least one hour. Drizzle some olive oil onto a pan and ladle a spoonful of batter onto the pan. Cook for 2-3 minutes on either side over a moderate heat. Serve with some berry compote and lashings of fresh, whipped cream.